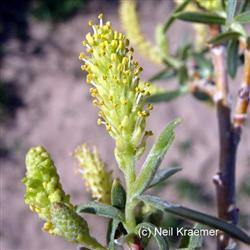 The deciduous Sandbar Willow, or Narrow-Leaf Willow, are native to the western hemisphere of North America, from Texas to California to Canada. They are comprised of thin gray leafs with smooth softgray bark, and can be shaped into a tree or shrub. These trees and shrubs are mainly found in wetter, well watered creek and canyon shed areas, but can be useful in your landscape for hedges or shade.